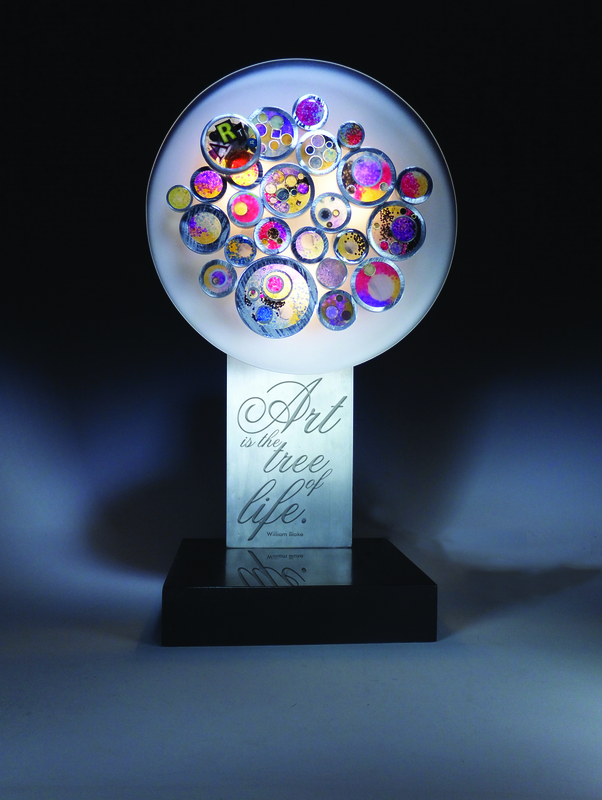 The 2012 Governor’s Award was created by Louisville artist Mark Needham. October is National Arts and Humanities month and the Kentucky Arts Council has several events that coincide with the month-long celebration. One of those is the Governor’s Awards in the Arts at 10 a.m. Tuesday, Oct. 9, in the Capitol Rotunda, Frankfort. Arts council staff has been planning for the day for some time. As I have only been part of the staff for about five months, it has been an interesting process to participate in and observe. As communications director, my main role in planning for the event was writing biographies for the awards program. For me, a former journalist and naturally inquisitive person who enjoys learning how other people live, work and play, this was a great assignment. The 2012 award recipients are pretty fascinating. I wanted to take a moment to share with you a few facts about each recipient. In case you can’t make it to the awards ceremony next week, you can still know a little about your fellow Kentuckians. Milner Award – William G. Francis, Prestonsburg: Mr. Francis and his wife, Linda Sadler Francis, have been major supporters of Jenny Wiley Theatre for more than 30 years. That’s three decades of faithful support that includes fundraising, financial contributions, providing housing for countless summer-stock employees, performing administrative tasks, selling concessions, handing out umbrellas and even cleaning up the theater after storms threatened to halt productions. Wouldn’t it be great if all theaters had a William Francis? Artist Award – Gray Zeitz, Owenton: Mr. Zeitz is the only publisher of books printed in the letterpress style in Kentucky. A friend to Kentucky authors, Mr. Zeitz is one of the only letterpress publishers in the nation to print two editions of his books – an affordable version and a special edition. He said he feels it’s important to make an affordable version so that more people will discover the beauty and art of the letterpress style. Business Award – UK HealthCare Arts in HealthCare Program, Lexington: I’ll be honest, I’m a little biased when it comes to UK HealthCare Arts in Healthcare. I have a family member who has spent considerable time in this hospital. In turn, I have spent considerable time visiting this hospital. Art is everywhere. It offers a welcome respite from the stress that comes along with a hospital visit. I am so personally appreciative of the program. So it was great to learn the program was an integrated effort that included input from the community and employees all while keeping the needs of patients and families in mind. It also features artwork by artists from every region of Kentucky. Putting Kentucky artists to work is always a reason to cheer. Education Award – Christina Hartke Towell, Morehead: I’m not playing favorites, but Mrs. Hartke Towell’s story is massively impressive. She created the Lucille Caudill Little Strings Program in the Rowan County school system. More than 140 students, including elementary, middle and high school students, as well as students with disabilities, have learned how to perform as soloists, in small chamber ensembles, and in large orchestra ensembles. Mrs. Hartke Towell started the string program to encourage participation in, and instill awareness and appreciation of, string music performance. Isn’t it wonderful Kentucky has artists dedicated to creating and ensuring the future of the arts? Folk Heritage Award – Leona Waddell, Cecilia: Mrs. Waddell has dedicated her life – and let me be clear, I mean more than 80 years – to conserving and perfecting the south central Kentucky white oak basket making tradition. She learned to make baskets as a child, with her 15 siblings, at her mother’s feet. What I found most interesting about Mrs. Waddell was her willingness to share her craft. Mrs. Waddell is known for inspiring others to excel in their own basket making and encouraging young weavers early in their careers. She has also restored basket making techniques that were once thought to be lost. Truly inspirational. Government Award – U. S. Rep. John Yarmuth, Louisville: I could spend the whole day writing about the countless ways Congressman Yarmuth has supported and participated in the arts during his lifetime. But I’ll sum it up quickly. Congressman Yarmuth has set himself apart from other governmental arts supporters in many ways, but none more notable than by donating his congressional salary to numerous non-profit and charitable organizations, many with an arts focus like the Governor’s School for the Arts, Louisville’s Fund for the Arts and the Kentucky School of Art. Since he first ran for Congress in 2006, Yarmuth has donated more than $600,000 to such organizations. Media Award – Jeffrey Lee Puckett, Louisville: I always enjoy a story where a person is so intent on pursuing a specific career that they will do anything to get there. Mr. Puckett, a music journalist, began his career in 1985 at The Courier-Journal, but he wasn’t writing about music. His first assignment was covering youth sports in the paper’s Neighborhoods section. Mr. Puckett was so intent on writing for the newspaper, he didn’t care much about what beat he covered. He readily admits he still doesn’t understand soccer. National Award – Bobbie Ann Mason, Lawrenceburg: I don’t think I could possibly say anything about Ms. Mason that hasn’t been said by someone much more eloquent than me. So let me state the obvious. Ms. Mason is a true Kentucky treasure and her career is one that many use for inspiration in their own writing. What I really enjoy about the work Ms. Mason has produced during her three decades of publishing is her ability to tell the human story in a way that is relatable to readers of all tastes. If you’re a great reader and lover of literature, you know there are times you search high and low – and still come up empty-handed – for a book you can connect with. Luckily, we never have to worry about that with Bobbie Ann Mason. Follow the links to read full biographies of each award recipient. We hope to see you on Oct. 9 at the presentation of the state’s highest honors in the arts.